---If these massive meatgrinders have already been made as player-usable weapons, please let me know! I do not intend to remake something someone else has already done, but browsing the internet, these forums, and the custom weapon list thread I have yet to see this idea implemented. Progress: About halfway to a testable beta. still needs an alt attack and to be implemented into the trader, plus numerous other smaller things (3rd person everything, not satisfied with the texture yet). It wasn't long before survivors had to start improvising their weapons. As soon as Husk cannons started being retooled for human use it wasn't long before admirers of melee combat began looking at the dead bodies of the giant fleshpounds with hungry eyes. Same as chainsaw (so no movement bonus). These bad boys, being originally wielded by one of the toughest enemies you face, should be pretty high tier and powerful. Random left/right hooks/swings with similar speed/damage to claymore. The Fleshy's double-fisted grindy uppercut. Does small damage a few times like the chainsaw's primary, then finishes the uppercut with a more powerful hit (possibly with knockback to counter the slow movement you would have with this weapon). If possible, this weapon should gib enemies like an explosion would if they do enough damage to kill/overkill an enemy (cause hey, you're poundin' flesh). Pretty expensive, tough to guess due to zerker's "top-tier" weapons being cheaper than say, an AA-12 or LAW. Most likely near the chainsaw's weight. Not sure how many melee weapons have different ranges outside of the claymore, but default/shorter range, probably akin to the chainsaw. This is a real weapon. Two bloody great handfuls. Nice one. Come on if you think you're hard enough! OMG. 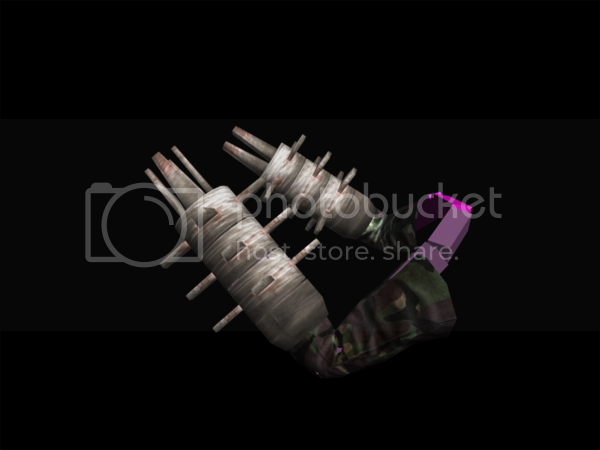 the "Severed Systems Pack: when you run out of ammo in the apocalypse, you'll use ANYTHING you can find!" haha. Siren head would be EPIC. lol, just tickle the hypothalamus to make her scream. You could try to name them by making a clever dosh <-> pound reference. From what I see in the image, you should make it a bit wider. without a reference in the picture its kinda hard to tell... they do feel a little longer and skinnier than the FP ones tho. Well they couldn't be exactly proportional to what's on the FP's arms because the FP is like 7+ feet tall, and those things are the size of your entire forearm! It would be like a sleeve if exactly proportionate. If not a sleeve then it would look like stilts on the ends of your arms! You'd be able to walk with them like crutches! well - it could be proportional, just scaled down. half size wouldn't be too bad methinks. That's what I meant to say, yes.